I am super pleased to have another guest post by Aida today! For those of you who don’t follow me on Instagram, you might not know that I had a baby last week! I’m doing well, but definitely not up to making something as awesome as these cookies by Aida. So I’m more than happy to have her share her energy and expertise! Hi Everyone! It’s me, Aida, from The Crafting Foodie, and I’m so happy to be back at Say Not Sweet Anne to share another decadent treat. 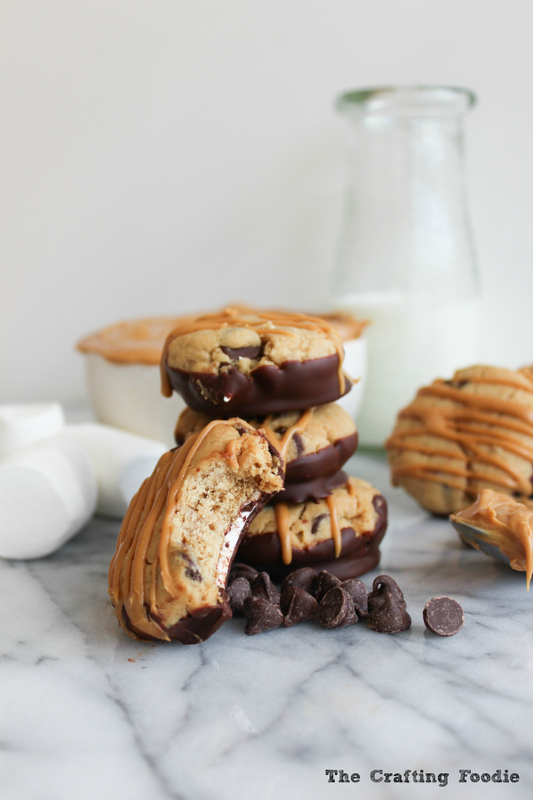 This time, I have Peanut Butter S’more Cookies for you. I came up with this recipe after making these S’more Sandwich Cookies. When I was eating a S’more Sandwich Cookie after dinner, I thought, “These cookies cannot get any better.” Then it hit me – what if I added some peanut butter into the mix? 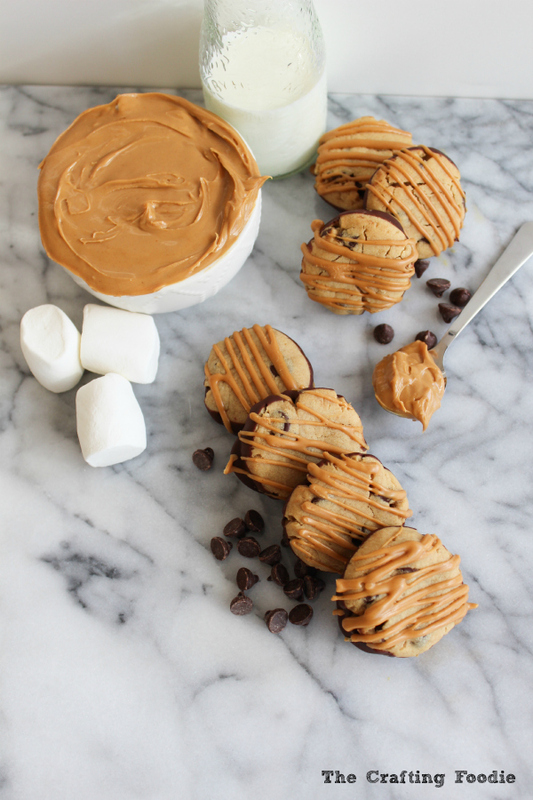 What is better than marshmallows, peanut butter, and chocolate? 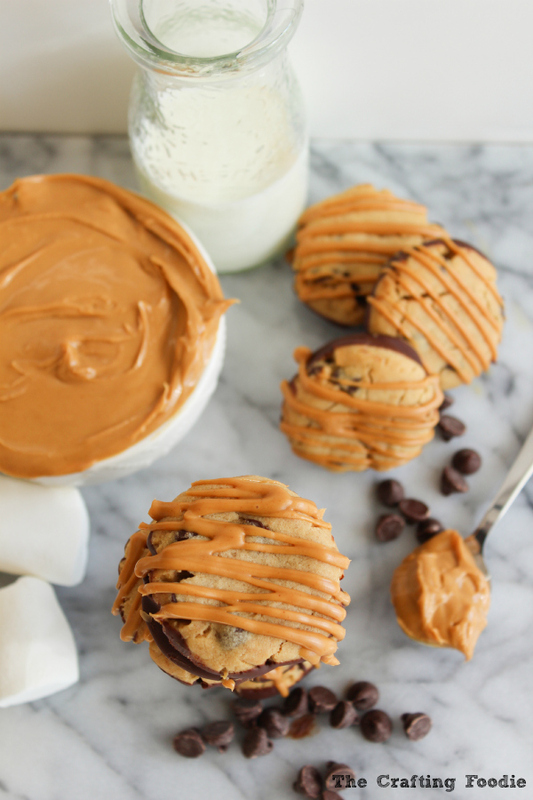 And that’s how these Peanut Butter S’more Cookies were created. 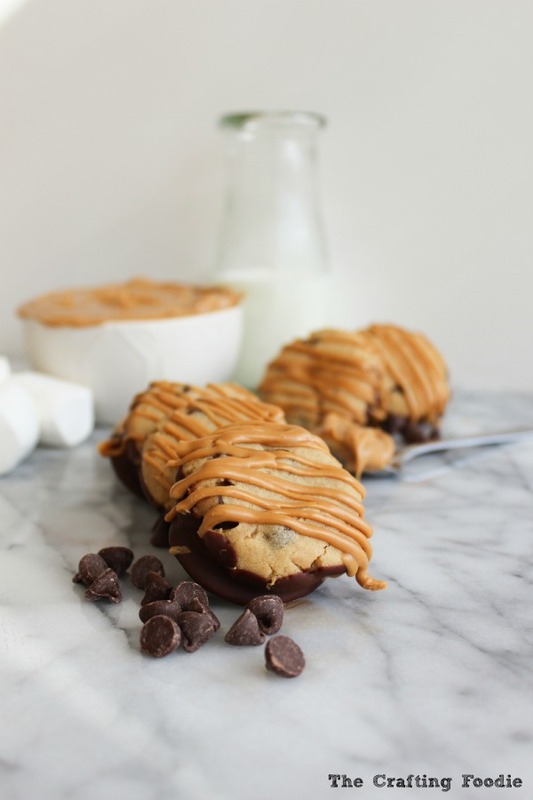 These Peanut Butter S’more Cookies are made a soft and chewy peanut butter cookies studded with chocolate chips, and it’s filled with a dollop of straight-up peanut butter and marshmallow fluff. Then the cookie is dipped in more chocolate and drizzled with peanut butter. So, basically, Peanut Butter S’more Cookies are marshmallow, peanut butter and chocolate with more peanut butter and more chocolate. Can you tell that I have a soft spot in my heart for peanut butter and chocolate? If you’re looking for more sweet treats, you can find more of my creations at The Crafting Foodie, on Facebook, Instagram, Google+, and Yummly. Preheat the oven to 350 degrees F. Line 2 baking sheets with parchment paper or silicone mats. In a medium bowl, sift the flour, baking soda and salt. Set aside. In the bowl of a mixer fitted with a paddle attachment, cream the butter, peanut butter, and sugar. Add the egg, honey, and vanilla. Mix until combined. Add the dry ingredients to the peanut butter mixture, and mix until just combined. Roll about 1 tsp of the dough out. Flatten the balls slightly. Place on the baking sheet. Bake for about 10 min. If you’d like chewy cookies, make sure to take them out of the oven before they brown. Move the cookies to a cooling rack to cool completely. Once the cookies are completely cooled, start assembling them. Spread about 1/4 tsp peanut butter on the bottom of each cookie. Chill the cookies in the freezer for about 15 minutes, until the peanut butter is very firm. Spread about 1 tbs of marshmallow cream over the peanut butter. Chill in the freezer until the cream is firm, about 15 min. While the marshmallow cream is chilling, make the chocolate coating. Melt the chocolate and shortening in a microwave safe bowl. Heat in 30 second intervals, mixing after each 30 seconds. Continue until the chocolate is melted. Dip the side of the cookie with the marshmallow cream into the chocolate coating. Place the chocolate side down on the baking sheet. Repeat with all the cookies. Chill the cookies in the freezer for about 15 min. 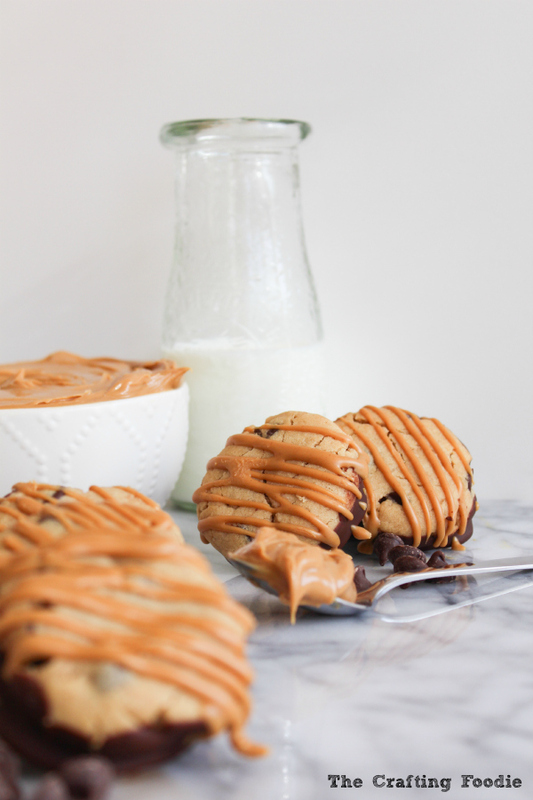 Remove the cookies from the freezer and drizzle with peanut butter if desired. I'm a wife and mother who blogs over at The Crafting Foodie where I share decadent desserts and healthy, easty-to-prepare weeknight recipes. When I'm not with my amazing family or cooking in the kitchen, I'm probably in my happy place - outside taking a run!